Under iumio Framework, a master corresponds to a controller that will allow you to perform your various treatments of your application solution. Each class name for a Master must end with the keyword “Master”. This keyword is a convention of iumio and allows the smooth functioning of the framework. 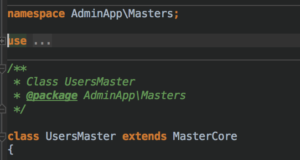 In addition, if your class does not finish with this keyword, when creating a route via Mercure, your activity will not be identifiable by the fact that your “Master” will not exist. Each “Master” must inherit the class “MasterCore” which allows him to have access to the method necessary for the development of your solution. At each application creation, a default master (DefaultMaster) is created to support you in the creation of your web application. All your masters must be in the “Master” folder of your application so that it is identifiable. Each first letter of your namespace must be capitalized.